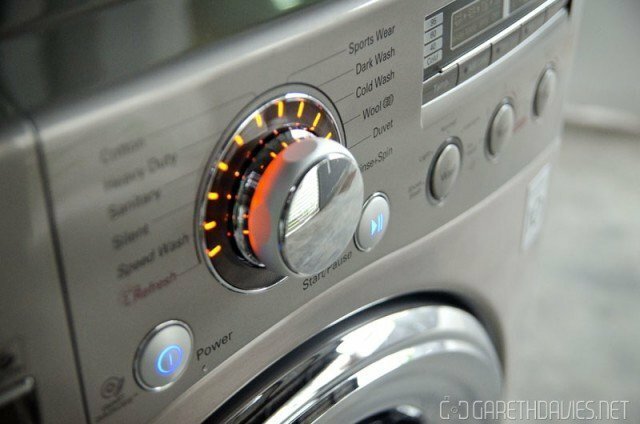 Somehow, we managed to live for 10 years without actually owning a washing machine – yes..TEN YEARS. In the previous apartment, and in this house for the past 4 years – we even have a spot in the back yard with a plug point, drain and tap. I guess it just never got prioritised, there’s always something more fun, more shiny, more hedonistic, more useless to buy. Utility items are not really romantic and often get pushed way down the list and are only gotten when you REALLY need them. The dobi (laundry) is near our house, charges reasonable prices, has great service and has never given us any real reason to not go there. Apart from the occasional holes in my clothes, odd socks missing and so on (more on that below). You can read about Kim’s side of the story here: The single best improvement of our life since Liam besides Liam…. The main features lead to energy savings (inverter and because there’s less friction), the washing performance is better and more gentle. And the motor is the main reason that attracted me to LG with the direct drive there’s no belt to break/wear out and they give an industry leading 10 year warranty on the Direct Drive motor. Also it’s a large capacity front-loader, front-loaders use less water, less energy, spin faster, heat the water hotter, clean clothes better (and more gently). The downside is of course front-loaders tend to be significantly more expensive. The installation was pretty simple, the technicians did it for us – they did a great job and explained the features of the machine well. It’s every important to make sure your washing machine is seated level on the ground so the drum spins properly and doesn’t damage the motor (hence my spirit level on top of the machine). I spent the first few months of Liam’s life hand-washing his tiny little clothes, there was a batch to do almost every day – it’s amazing how much laundry a little tiny baby can produce (booties, gloves, onesies, bibs, swaddling clothes, our clothes, sheets etc with his pee/puke on it). 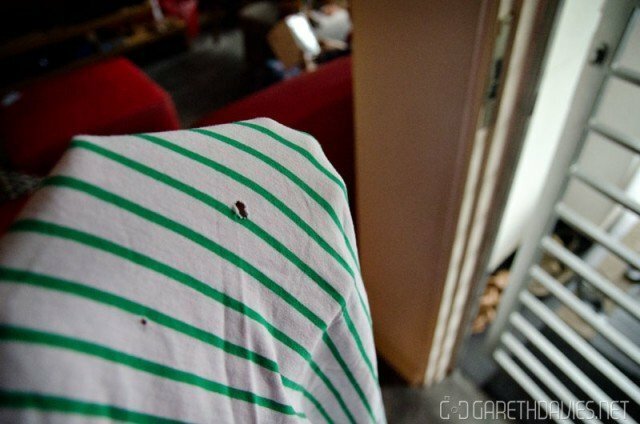 I bought this t-shirt from Marks & Spencers and I really love it (and it was quite expensive) and the first time I washed it at the dobi…it came back with holes in it – gutted. 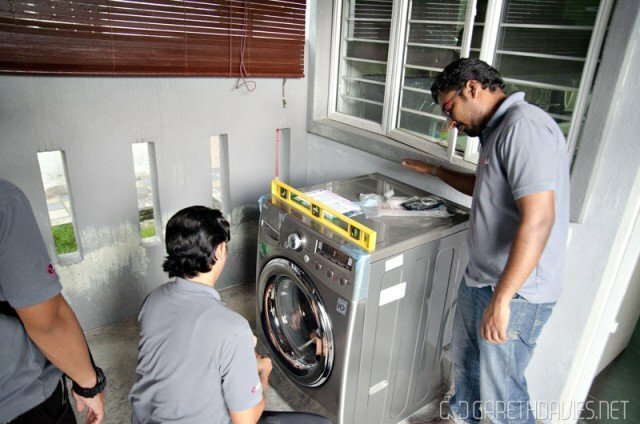 Also one more really bad con, was I used to use the dobi in my appartment complex long ago and once when I was away for a few weeks on a work assignment…they closed down and disappeared. And yah, all my clothes were there – all my favourite clothes! 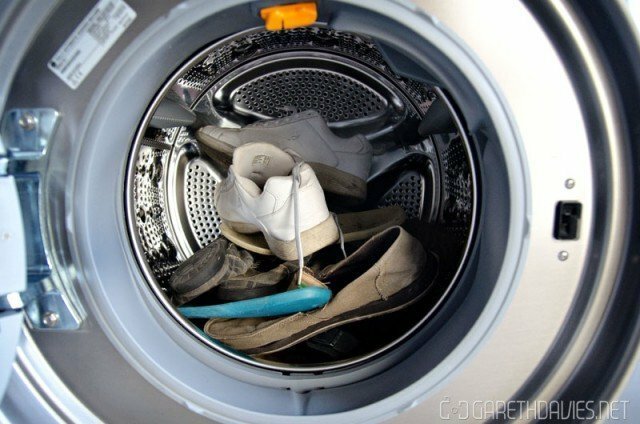 One of the great things I found about this machine in particular too is it has a shoe mode (not sure how common that is) – but my shoes are stored outside and got super nasty/dusty/hairy etc and were basically unwearable. 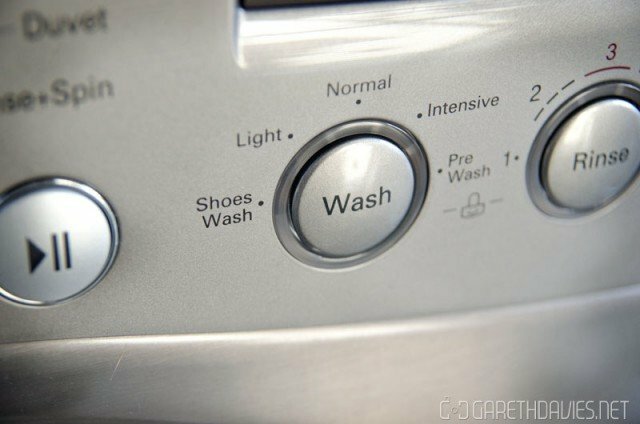 The shoe mode is basically especially designed for washing shoes without damaging them – super useful! But after a round in the machine, boom as good as new – couldn’t believe it. I can finally wear all my cool sneakers again (I had a really sloppy slippers only period, which I’m over now haha). 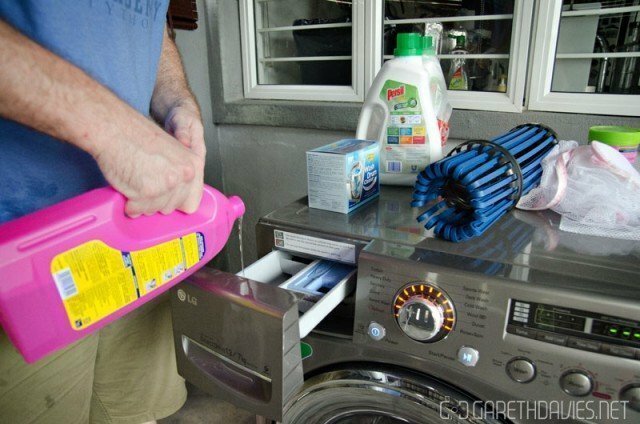 There’s some other useful features too like the Intensive wash mode for my stinky sports clothes, a built in tub cleaning cycle (the technicians recommend doing this about once a month, you can buy tub cleaning solution from Cosway). I also really love that it calculates how long it’s going to take to complete the selected cycle and displays the time remaining on the front, great for planning when you need to hang the washing out. 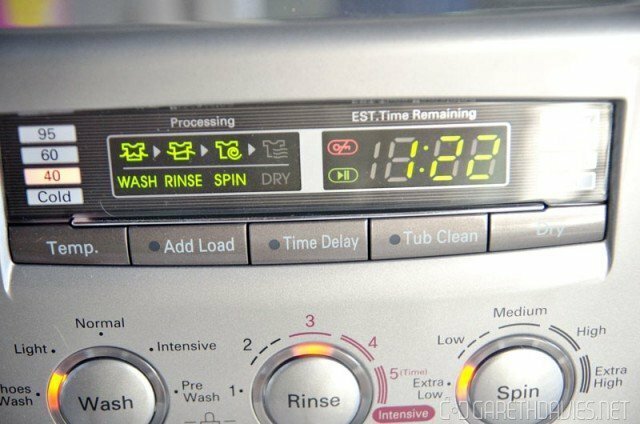 The scheduling is useful too, it shows the number of hours until the selected cycle completes – good when you want to wash some stuff late at night and hang it out the next day. I honestly didn’t feel like running/playing badminton so much because of the stinky clothes I generate – now it’s not a problem. Seriously I can use 3 t-shirts in one badminton session + shorts, boxers, 2 towels and so on. Previously they would be festooned all over the house stinking the place up – now they are in the washing machine as soon as I get home and washed/hung-out before bed time. So awesome. So yah, having a great time so far – no real cons with the machine I’ve noticed so far. It’s super quiet and doesn’t vibrate even during fast spinning, it looks good and suits our design aesthetics (which is a bonus of course). Not a big fan of the traditional white enamel style washing machines, this grey/silver spaceship look suits me much better. The RRP for this machine is RM5499 – worth every cent if you ask me. I’ve already written so much about it, I’ll have to talk about the drying feature some other time. It’s super easy to use, I love it, in fact the first few days after getting it I just kept washing stuff because it was so fun and easy haha. I put a load in just now actually. If you have any questions, do ask in the comments below I’ll do my best to answer. The full range of machines available from LG can be seen here – Washer Dryers (our machine). You can check out the current year end promotions from LG here – LG Malaysia Promotions. Happy 1st Wedding Anniversary To Us! Merry Christmas & A Happy New Year For 2015!